More background info: Solidarnosc ('solidarity') was the name adopted by Poland's worker-based free trade union movement that came out of a history of protests through the 1950s to the 1970s, and was primarily centred around the Gdansk shipyards and the steelworks of Krakow at Nova Huta, but also active elsewhere in Poland. Unrest came not only as a result of the increasing economic hardship of food shortages, rationing, rising prices, but also from a deep longing for political freedom. Resistance had already been a defining characteristic of Poland's psyche during the years of the World War II Nazi occupation (cf. Warsaw), and Soviet communist repression wasn't accepted long-term either. This was coupled with Poland's deeply ingrained Catholicism, which characteristically fuelled political opposition in this country too. Being a charismatic and media-savvy character Walesa certainly fulfilled the role of the movement's leader well. Although there had always been controversy over his style of leadership too, not least on the part of some grass-roots activists from the movement's early days. But his well publicized appearances on TV surely helped to weaken the country's communist regime and thus facilitated the movement's ultimate success. Walesa even became an international celebrity, especially after he was awarded the Nobel Peace Prize in 1983. However, after some initial successes in 1980, including agreements with the government, there first came a drastic backlash: in December 1981, after mounting pressure from the Soviet Union, universal martial law was declared for the entire country by General Jaruzelski. This Polish government leader of the time, whose wooden appearance and huge dark shades were a bit reminiscent of Kim Jong Il, were almost emblematic of the rigidity of the old guard's rule. Telephone lines were cut, activists were rounded up, arrested and interned (even in special camps), curfews were imposed, and the militia controlled the streets. There were fatalities too – in Katowice, for instance, nine protesting miners were shot dead. And so it looked like the old approach of brutal repression would work yet again, just as it had before, not just in Poland but also elsewhere: 1953 in the GDR, 1956 in Hungary, and in the crushing of the Prague Spring in 1968. Another figure of historical importance that has to be mentioned at this point is Pope John Paul II – who was originally from Krakow. His support for the resistance movement in his home country and his visits back home, when he was welcomed by hundreds and thousands of Poles, certainly helped to raise media attention and further upped the pressure on the communist government. Towards the late 1980s, Solidarnosc was stronger than ever and managed to force through concessions by the government, as well as meetings at a "Round Table" (a term later adopted during the negotiations in the final months of the GDR too). Eventually, Solidarnosc was not only officially recognized but semi-free elections were held. Only 'semi-free' in that the government still retained a guaranteed 65% of seats in parliament – only the remaining 35% came up for free elections. Still, all but one of those seats were won by the opposition. A clear signal, sure enough. In the wake of this, General Jaruzelski departed and Solidarnosc member Tadeusz Mazowiecki, formerly editor-in-chief of Solidarosc's premier underground paper, became the first non-communist prime minister in an Eastern Bloc country. At the end of 1989 Poland was a 'Republic' again – the communist era was over. These developments set the scene for the overthrowing of the communist regimes in the other satellite states of the Soviet Union too: Hungary, the GDR, the CSSR, Romania, Bulgaria, and later the ex-Soviet republics of e.g. Azerbaijan, Ukraine and the Baltic States of Lithuania, Latvia and Estonia. Thus Poland's long struggle against communist repression is often seen as the main catalyst for the whole disintegration of the Eastern Bloc and its communist regimes. In Poland, Lech Walesa proceeded to become the country's president in 1990, a post he held until 1995. By then Solidarnosc had faded pretty much into insignificance as a political party, though it continues to exist as a trade union; and Lech Walesa too failed to get re-elected as Poland's president in 1995. The times had clearly changed, as had Poland. 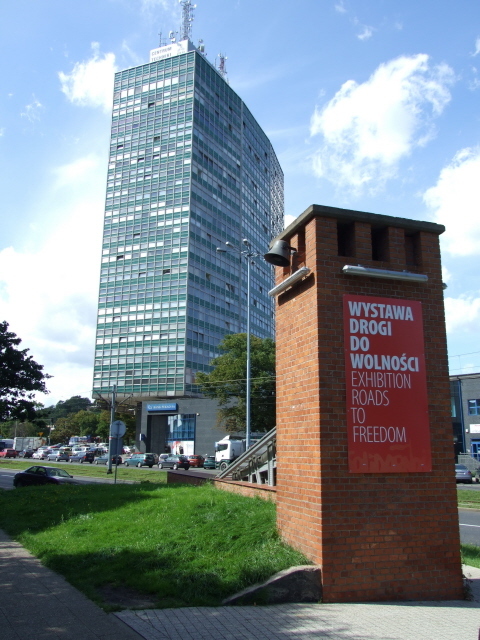 However, the achievements of Solidarnosc remain firmly part of the nation's psyche and the history of modern-day Poland – a fact clearly brought home in the "Roads to Freedom" exhibition. What there is to see: UPDATE: the Roads to Freedom exhibition, which once had to move before, is due to relocate yet again, namely to the new European Solidarity Centre (or ECS for the Polish 'Europejskie Centrum Solidarności'), which is currently under construction at Plac Solidarnosci. The move is supposed to take place by the end of 2013 … we'll see. How much the exhibition will change also remains to be seen. My guess is not all that much, at least not in content, general thrust and in its thematic subdivisions. Why change a winning team? If anything we can hope it will be even better, probably more multimedia-heavy and utilizing much more space. The text below describes the exhibition in the state I've seen it in the summer of 2008. It can still serve as a guide as to what to expect of it content-wise in general. But details in layout are likely to change, with more space and even more state-of-the-art design and media. It's quite a modern exhibition with some of the usual trimmings of multimedia and interactive computer workstations in between the actual exhibits. The latter include a reconstructed police cell – as they apparently were used by the militia for locking up arrested demonstrators. Then there's a life-size model of a communist-era shop –accompanied by text panels explaining the food shortages and rationing system of the day. Another such mock-up is a set of negotiating tables, complete with empty beer-bottles and overflowing ashtrays – and a blown-up photograph of the real negotiations on the wall behind, so that you can compare original and mock-up, as it were. A mock-up of a makeshift printing shop recalls the days of underground activist publishing. But there are also original artefacts, most notably the giant red pen, with an image of Pope John Paul II set in itto it. This is the pen Lech Walesa used to sign the August agreements of 1980, or the original "21 demands" which Solidarnosc put before the government and publicly placed on a large plywood board then hung off the Gdansk shipyard gates for everyone to see. There are also various personal effects of Solidarnosc members and some authentic banners/flags used in demonstrations back then. Original documents and newspaper cuttings on display are naturally in Polish only, explanatory text panels, however, are consistently bilingual, Polish and English (and the quality of translation is adequate). The material played at various points on video screens is subtitled in English too. At the computer workstations you get the same choice of languages as well. The latter allow for quite some freedom in how deep you want to delve into the details of the whole subject. The wealth of information at these stations is almost overwhelming, though very well structured, making it fairly easy to approach this repository of background information in a selective manner. The video material can be viewed selectively too, of course, but it's worth taking it all in. But be warned, there are some pretty gruesome bits included too, e.g. footage of a demonstrator being run over by a militia vehicle. The museum is structured thematically, with different rooms devoted to different aspects, such as everyday life under communism, the origins of Solidarnosc including that of the name and the logo, the days of martial law, methods of underground activism, the "round table" talks, etc. – and a section towards the end is devoted to the other Eastern Bloc countries' struggle for freedom in the wake of the example that Poland had set. Overall, the atmosphere is understandably celebratory of the achievements of Solidarnosc and at the same time condemning of communism. Naturally it places a special emphasis on what happened in Gdansk and its shipyards too, but it nevertheless tries to have a wide scope going beyond that specialized framework. The variation of approaches and display techniques is indeed impressive. The "Roads to Freedom" exhibition is frequently regarded as one of the best museums in the whole of Poland – and you can see why. Although these days, the No.1 position in that league table has probably been taken over by Warsaw's Uprising Museum. 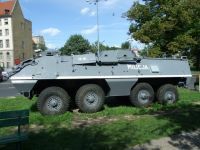 The largest exhibit at the "Roads to Freedom" exhibition is actually placed outside the entrance – an armoured vehicle of the former militia – and serves as a landmark, making it easy to locate the entrance to this underground museum too. By the way, the exhibition moved several years ago to this underground location too (how fitting!). Initially it was housed in the original buildings where the first agreements between Solidarnosc and the then government were signed. And so it also no longer includes the rather bizarre monuments, one of which looks a bit like a mangled roller coaster that is still to be seen beyond the gates to the Gdansk shipyards off Plac Solidarnosci. Despite the move from its more "original" location, the overall quality has certainly been improved, especially for foreign visitors. There are plans to further expand the exhibition and eventually move it yet again, possibly back to its original location within the premises of the Gdansk shipyard. Again, UPDATE: this move now seems imminent – with the new European Solidarity Centre at the old shipyards nearing completion. See also under Plac Solidarnosc and Gdansk. 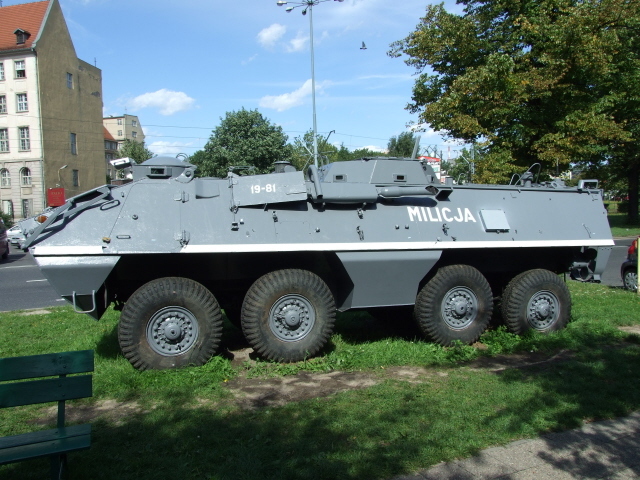 Location: right by Plac Solidarnosci – roughly opposite the huge monument by the Gdansk shipyard's gates – look out for that grey armoured militia ('Milicja') vehicle by the entrance. Access and costs: quite easy, inexpensive. Details: easy to get to on foot: a ten-minute walk from the main railway station (Gdansk Glowny), along Podwale Grodzkie and ul. Waly Piastowskie (or one tram stop), and about half an hour's stroll from Gdansk city centre and its waterfront, at the end of ul. Lagiewniki.. Admission: 6 zloty (in August 2008), reduced rates (2 zloty) on Wednesday (also half-price concession for groups of 10 or more). Opening times: daily except Monday (and Catholic public holidays) from 9 a.m. to 5 p.m. NOTE: these details are likely to change somewhat when the exhibition moves to its new premises. Time required: up to two hours should normally do – but you could possibly spend even more time here, especially if you can understand Polish and read the original documents, or if you want to go through all of the interactive material on the computer workstations. Combinations with other dark destinations: Since the entrance to the exhibition is right on Plac Solidarnosci, it is almost obligatory to pay a visit to the monuments there too, which are located by the old gates to the Gdansk shipyard that played such a role in Poland's struggle for freedom. If walking to/from the Old Town of Gdansk and its waterfront at Targ Rybny you could also visit the nearby Polish Post Office museum. Finally, the boat trip departing from the Old Town's waterfront that go out to Gdansk's other WWII sites at Westerplatte take you past some of the Gdansk shipyard's active parts, which is also quite sight to behold.